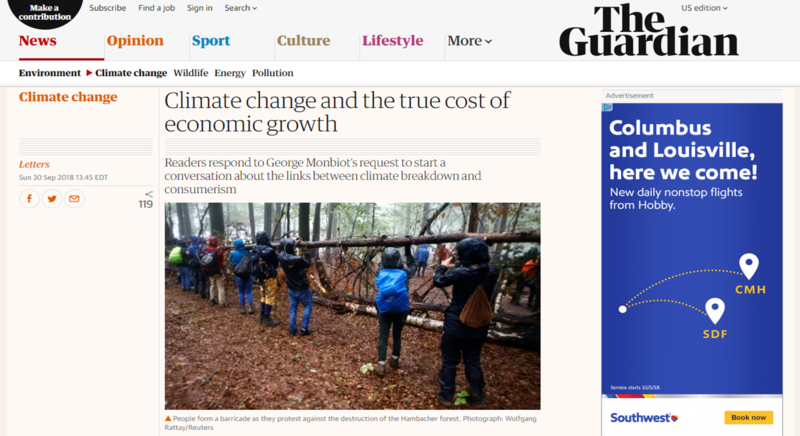 ‘Climate Change and the True Cost of Economic Growth’ – A Grauniad Fairy Tale | Watts Up With That? This article is a follow-up to George Moonbat’s While economic growth continues we’ll never kick our fossil fuels habit,covered by Eric Worrall in this post: Monbiot: The Stimulus Effect of the Renewable Economy is Tempting Green Entrepreneurs to Fly More. Too fracking funny! The pop-up ad is for Southwest Airlines! If George Monbiot really wants to get people talking about the connection between climate change and the economy, he’d do better to find a different question to “how do we stop growth?” (While growth continues we’ll never kick our fossil fuel habit, 26 September). The elephant in the room is the assumption that nature’s resources and capabilities are so large that they can be considered infinite and so excluded from the economic cost of production. This has the unintended consequence of rewarding destruction. Hence the German situation in Hambacher: the lignite has value because it can be sold to be burned, the 12,000-year-old forest has none unless the trees are cut down for economic use. And, in an infinite world, there are always more 12,000-year-old forests. This form of thinking might have been a useful simplification when human population and activities were at the levels of the Enlightenment, when much of the philosophy that still drives the economy was developed. Indeed, for any one individual the world is still a remarkably big place and it is difficult to imagine it running out of anything. But a resource that would have supplied an Enlightenment-sized population for 500 years would last today’s just 35 years. And that is without considering increased rates of consumption. Make the UK more bicycle-friendly, like Holland. The BBC should stop ignoring climate change. “Stop driving fossil-fuel cars. Become vegetarian. Consume less. Use less energy…” ad nauseum. Reduce the human population… “but this obviously raises some unpleasant decisions.” Not if you’re a Vogon. I won’t bother to ridicule the useful idiots (the readers whose comments were summarized above)… Unless calling them useful idiots is a form of ridicule… In which case I just ridiculed them. Instead, I’ll focus on ridiculing the Grauniad’s idiotic preamble. 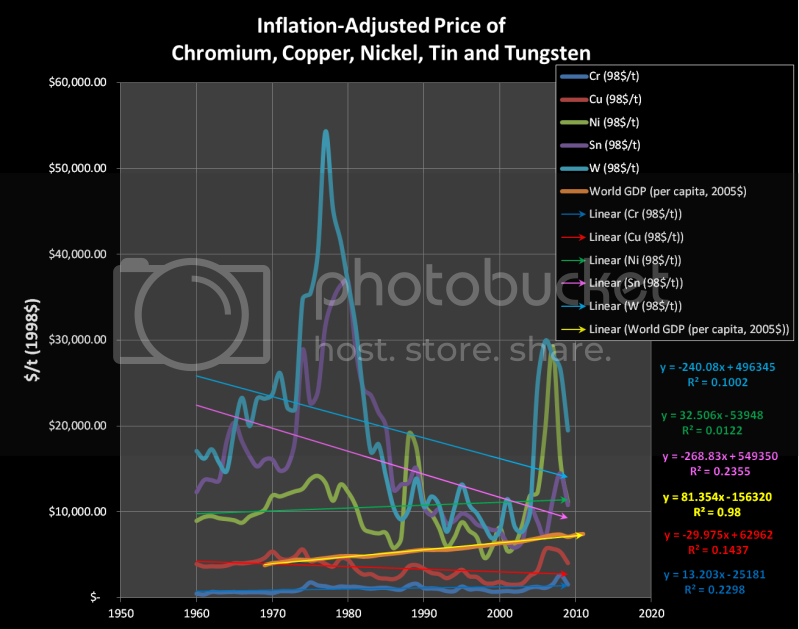 Warning: The rest of this post is a rather detailed discussion of resource economics. There is no “true cost of economic growth.” The cost of economic growth, including compliance with regulations, is built into the calculation of economic growth. To the extent that future climate change may or may not impact future economic growth, there’s no evidence that “carbon” regulations will do anything other than moving the costs back in time from the future to the present. A real-world discount rate zeroes out all potential “benefits” of carbon regulations. The “social cost of carbon” (SCC) is a key feature in the debate over climate change as well as the principal justification for costly regulations by the federal government. We here at IER and other critics have raised serious objections to the procedure by which the Obama Administration has produced estimates of the SCC. Last summer I did a post on the GAO’s whitewash of our criticism, and now—just before the Independence Day holiday weekend—the Office of Management and Budget (OMB) has released its own whitewash. There are several key points on which the Administration is obfuscating, but in this post I’ll focus just on the choice of discount rates. This one variable alone is sufficient to completely neuter the case for regulating carbon dioxide emissions using the social cost of carbon, so it is crucial to understand the controversy. Why Do We Discount Future Damages? Present dollars are more important than future dollars. If you have to suffer damage worth (say) $10,000, you will be relieved to learn that it will hit you in 20 years, rather than tomorrow. This preference isn’t simply a psychological one of wanting to defer pain. No: Because market interest rates are positive, it is cheaper for you to deal with a $10,000 damage that won’t hit for 20 years. That’s because you can set aside a smaller sum today and invest it (perhaps in safe bonds), so that the value of your side fund will grow to $10,000 in 20 years’ time. In this framework, it is easy to see how crucial the interest rate is, on those safe bonds. If your side fund grows at 7% per year, then you need to set aside about $2,584 today in order to have $10,000 in 20 years. But if the interest rate is only 3%, then you need to put aside $5,537 today in order to have $10,000 to pay for the damage in 20 years. An equivalent way of stating these facts is to say that the present-discounted value of the looming $10,000 in damages (which won’t hit for 20 years) is $2,584 using a 7% discount rate, but $5,537 using a 3% discount rate. The underlying assumption about the size and timing of the damage is the same—the only thing we changed is the discount rate used in our assessment of it. Generally speaking, the climate damages that occur in computer simulations don’t begin to significantly affect human welfare in the aggregate until the second half of the 21st century. In other words, the computer-simulated damages need to be discounted over the course of decades and even centuries. (The Obama Administration Working Group used three computer models to calculate damages through the year 2300.) Thus we can see why the choice of discount rate is so crucial. In its latest revision, the Working Group estimated that for an additional ton of carbon dioxide emitted in the year 2015, the present-value of future net damages would be $11 using a 5% discount rate, $36 using a 3% rate, and $56 using a 2.5% rate (see table on page 3 here). Yet when the media refer to these numbers as “the social cost of carbon,” it obscures how arbitrary the figures are. They can range from $11/ton to $56/ton just by adjusting the discount rate in a narrow band from 5% to 2.5%. Fortunately, OMB provides explicit guidance (in the form of “OMB Circulars”) to federal agencies on how to select discount rates. Specifically, as we carefully explain on pages 12-17 of IER’s formal Comment, OMB Circular A-4 (relying in turn on Circular A-94) states that “a real discount rate of 7 percent should be used as a base-case for regulatory analysis,” as this is the average before-tax rate of return to private capital investment. Now it’s true, Circular A-4 goes on to acknowledges that in some cases, the displacement of consumption is more relevant to assess the impact of the policy under consideration, in which case a real discount rate of 3 percent should be used. Thus it states: “For regulatory analysis, you should provide estimates of net benefits using both 3 percent and 7 percent” (bold added). Figure 3 from Nordhaus (2017), modified by author. A linear extrapolation of Nordhaus’ discount rate plot implies that a 7% discount rate would zero-out the social cost of carbon. Dean Wormer just never gets old! This notion is mind-boggling in its idiocy. Depletion is very much not “excluded from the economic cost of production.” The depletion rate is integral to the economics of all mining and resource extraction industries. 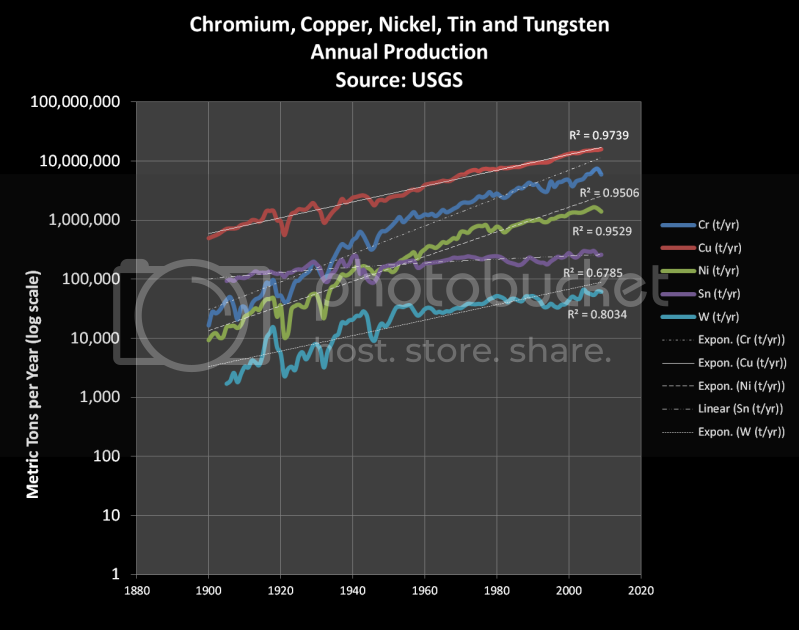 Cu, Ni and W have slightly negative slopes; while Cr and Sn have slightly positive slopes… Only chromium’s (R^2 = 0.3187) and copper’s (R^2 = 0.1719) trend lines approach statistical significance. The GDP slope is positive and highly statistically significant (R^2 = 0.98). 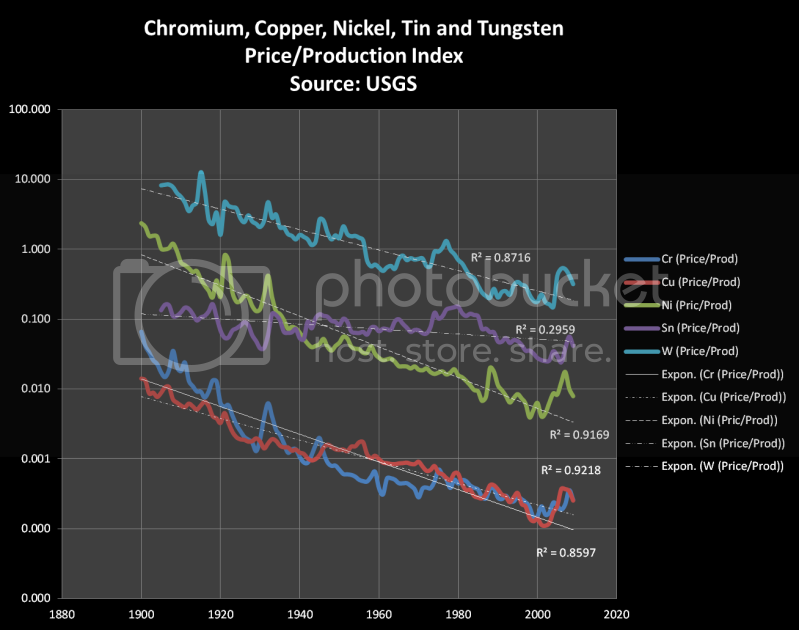 The GDP slope (81.354) is almost three times larger than the largest positive metal slope (Ni, 32.506). 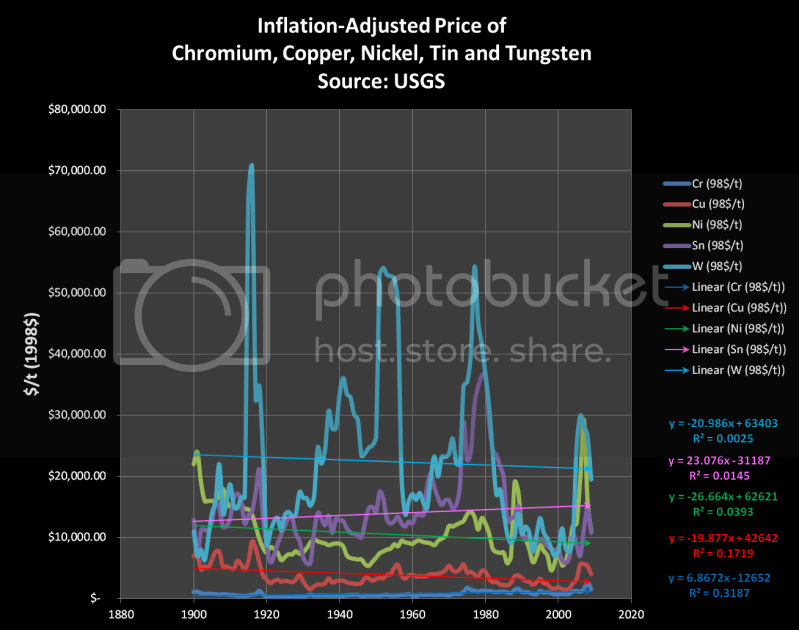 If these metals were becoming more scarce, the price would be rising faster than the supply. Proved mineral reserves are not fixed numbers. They are generally the “P90” number. There is a 90% probability that the proved reserves can be economically recovered from existing, developed mineral deposits. 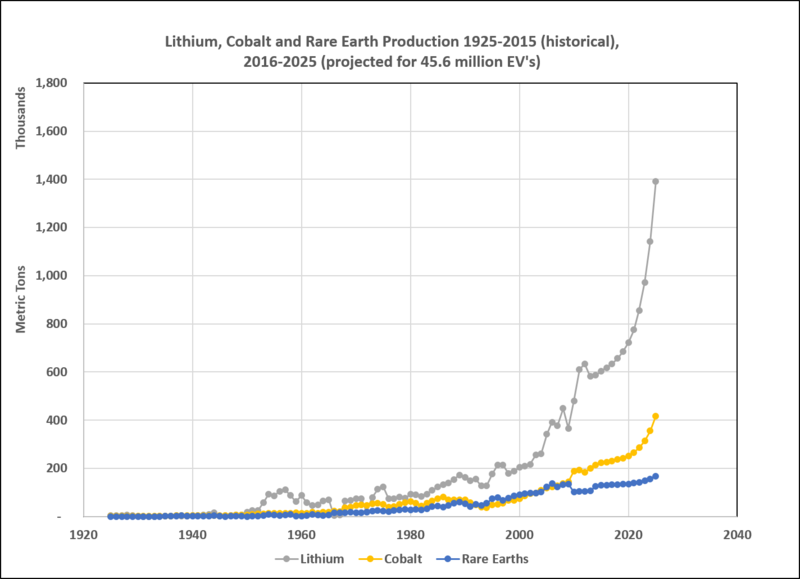 The total resource potential is much higher than the proved reserves. However, companies generally try to replace their annual production to maintain, or preferably increase, their proved reserves. Petroleum, Natural Gas and Coal… Oh My! The world has only consumed about 17% of its estimated total petroleum resource potential. For every barrel of petroleum that has been produced and consumed there are about five barrels of petroleum remaining in the ground. Of course this will all change if proved reserves and resource potential continue to grow. 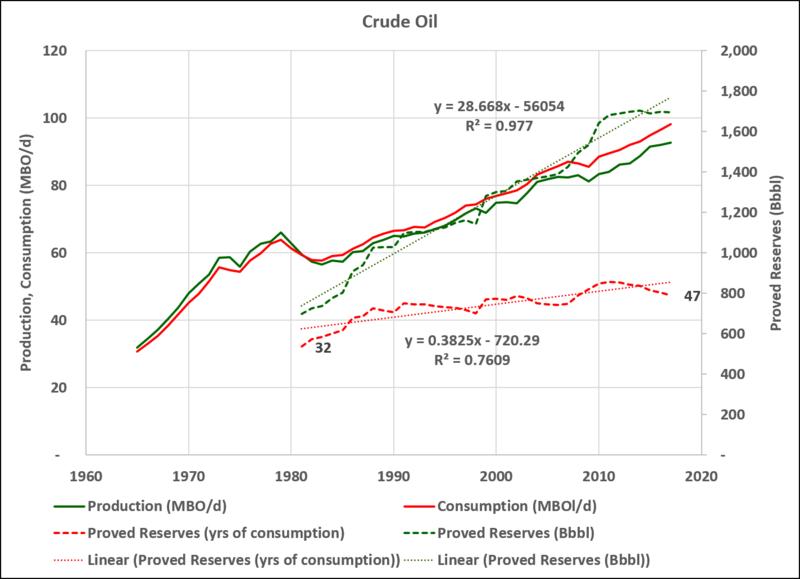 Crude Oil Proved Reserves = 47 years of current consumption. MBO = million barrels of oil. Bbbl = billion barrels of oil. BP 2018 Statistical Review of World Energy. 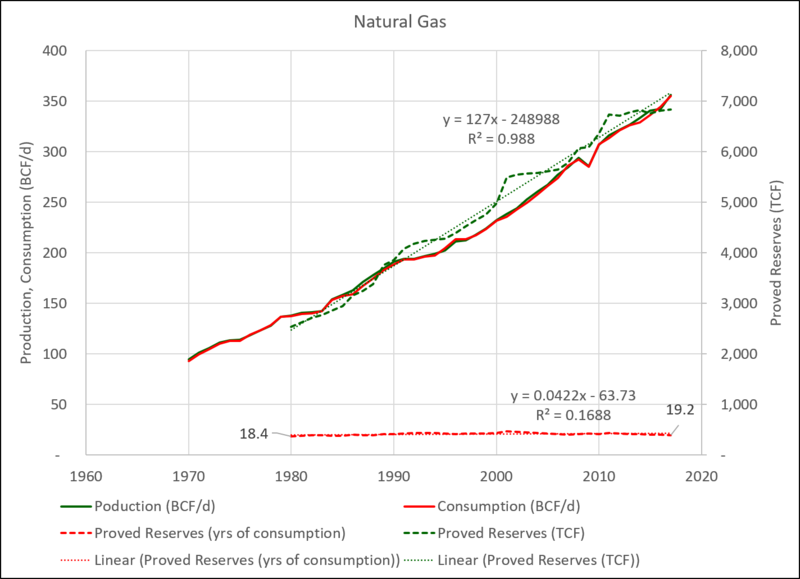 Natural Gas Proved Reserves = 19 years of current consumption. BCF = billion cubic feet of gas. TCF = trillion cubic feet of gas. 2018 BP Statistical Review of World Energy. 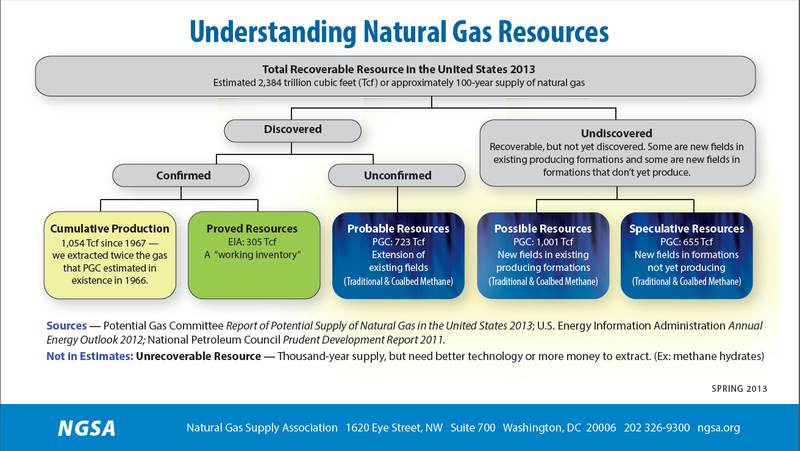 Of course, like petroleum, proved reserves of natural gas are just a fraction of the resource base. 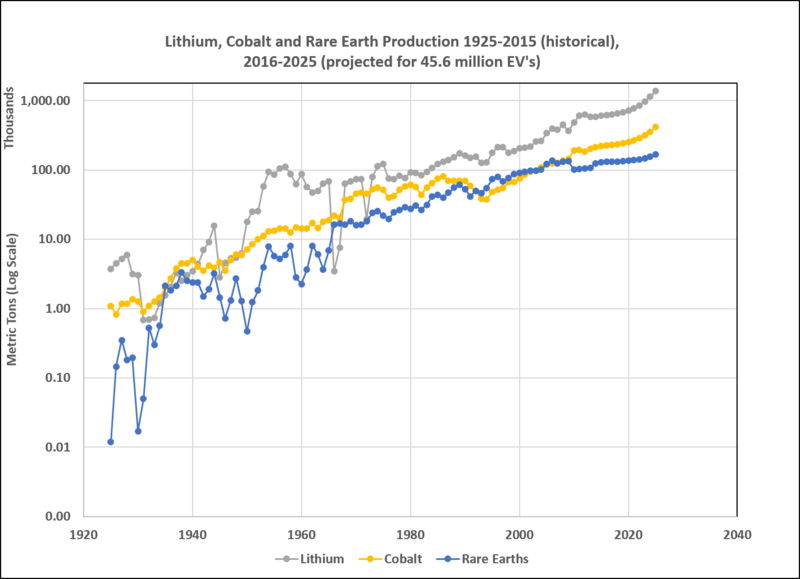 In the chart below, proved and probable resources are equivalent to proved (P90, 1P) and probable (P50, 2P) reserves. P50 probable reserves (1P+2P) are nearly three times that of P90 proved reserves. 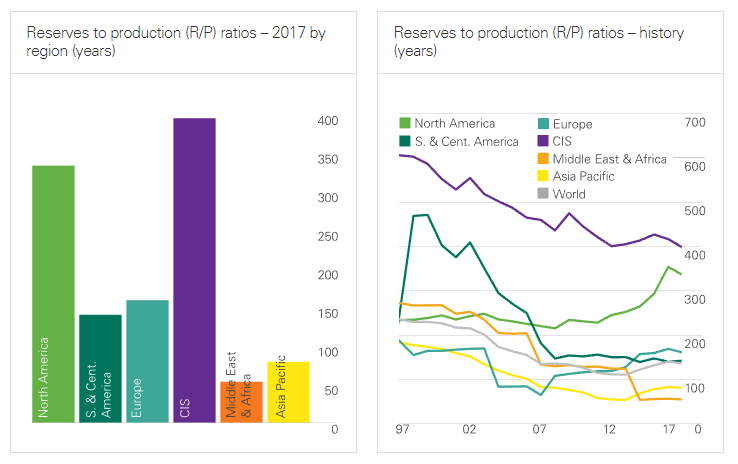 Reserves-to-production (R/P) ratios represent the length of time that those remaining reserves would last if production were to continue at the previous year’s rate. They are calculated by dividing remaining reserves at the end of the year by the production in that year. The R/P ratios are calculated excluding other solid fuels in reserves and production. Coal resources are a bit more difficult to assess. However, they are fracking YUGE. The USGS has not conducted a coal resource assessment for these United States since 1974. Demonstrated Reserve Base (DRB) is the sum of coal in both measured and indicated resource categories of reliability. The DRB represents 100% of the in-place coal that could be mined commercially at a given time. EIA estimates the DRB at about 476 billion short tons, of which about 69% is underground mineable coal. Estimated recoverable reserves include only the coal that can be mined with today’s mining technology after considering accessibility constraints and recovery factors. EIA estimates U.S. recoverable coal reserves at about 254 billion short tons, of which about 58% is underground mineable coal. Recoverable reserves at producing mines are the amount of recoverable reserves that coal mining companies report to EIA for their U.S. coal mines that produced more than 25,000 short tons of coal in a year. EIA estimates these reserves at about 17 billion short tons of recoverable reserves, of which 65% is surface mineable coal. The most recent resource estimate is 10 times the demonstrated reserve base, which is roughly 10 times the recoverable reserves at producing mines… And… Despite generating nearly 30% of our electricity from coal, the producing mines have no difficulty supplying more than enough coal. 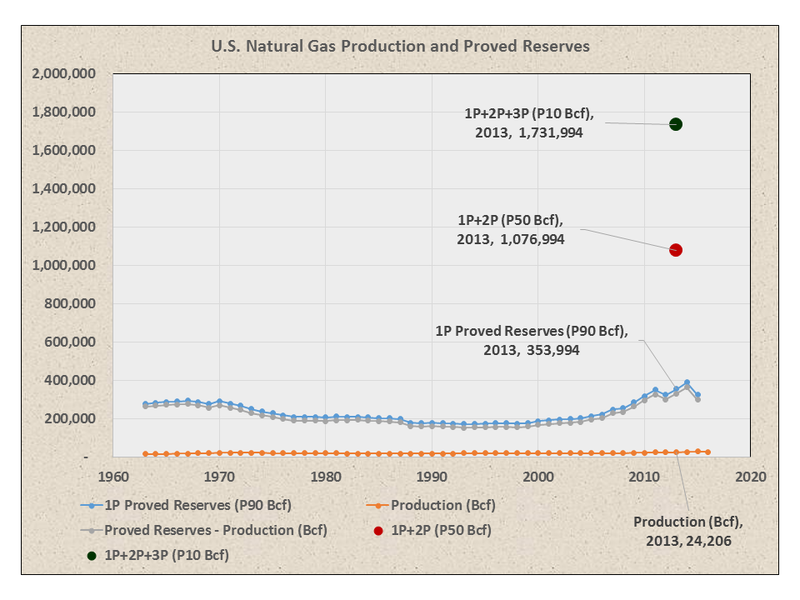 How Can Reserves Continue to Grow as Oil Production Increases? are those with a “reasonable certainty” (a minimum 90% confidence) of being recoverable under existing economic and political conditions. We can discussed the differences between proved developed, proved undeveloped, etc. with a later post. However, it should be pointed out that proved reserves are the only reserves recognized by the U.S. SEC. This is why energy companies strive to get the latest technology and recovery methods recognized by the government, therefore increasing the chance of “reasonably” recovering oil and gas assets and therefore raising their reserves as well. are petroleum and gas quantities with a 50% confidence level of recovery. Basically, you may be able to get some, you may not. are quantities with a minimum 10% certainty of being produced. Basically, your long shot discoveries. Only gamble on these types of assets if your Magic 8-Ball tells you to. All right! That takes care of reserves! But what about resources? 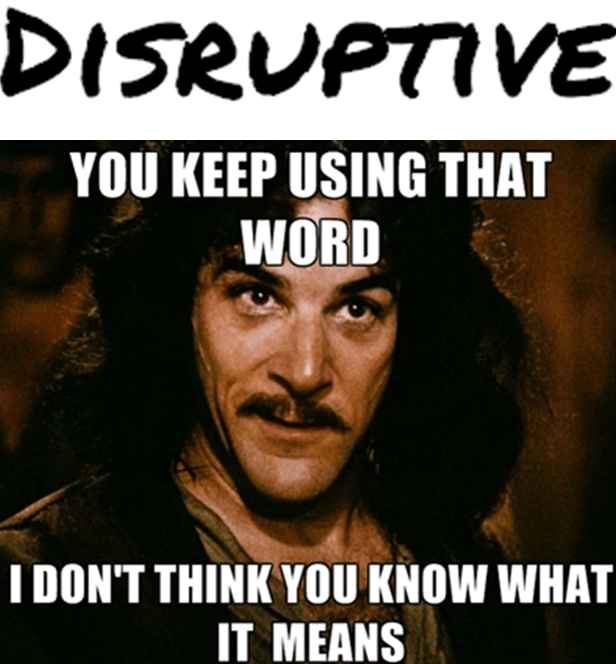 For those of you who have looked at on the market ads, you’ll spot this term a lot in the literature. So what is resources? Again, we turn to the SPE. There are two categories of resources: contingent and prospective. are quantities of petroleum estimated, as of a given date, to be potentially recoverable from known accumulations, but the projects are not yet considered mature enough for commercial development due to one or more contingencies. In other words, there’s a good idea of how much oil and gas is in the reservoir, but issues such as political and social events or even a lack of market prevent production. There can be a major oil discovery in the Congo right now. You want to risk getting shot to get to it? are quantities of petroleum estimated to be potentially recoverable from undiscovered accumulations by application of future development projects. These sorts of resources basically exist in the minds of marketing people. That’s not to say that they don’t exist in the real world as well, it just means that E&Ps are thinking of future oil and gas discoveries in new areas, based on upcoming technology and the discoveries made in similar formations worldwide. Okay! I hope that helps! Until next time, may the resource be with you. Live long and prospect. Proved reserves is the minimum volume of oil that is expected to be produced from a well quantified reservoir. This is generally the P90 number: There is a >90% probability that the proved reserve volume will be produced. This is often called 1P. 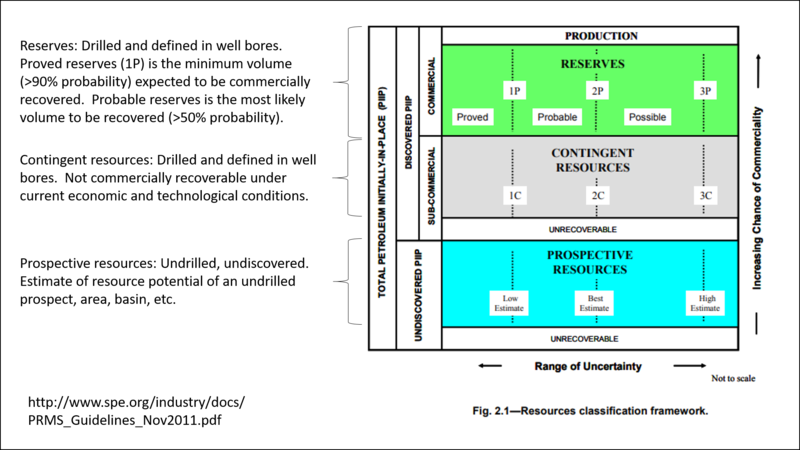 Probable reserves is the most likely volume of oil that is expected to be produced from a well quantified reservoir. There is >50% probability that the probable reserve volume will be produced. This is called 2P and it is actually the current assessment of the most likely volume that will be produced. In some cases, seismic HCI’s can be used to delineate proved reserves, particularly if HCI’s have a track record in the field and/or play of accurately defining hydrocarbon accumulations. 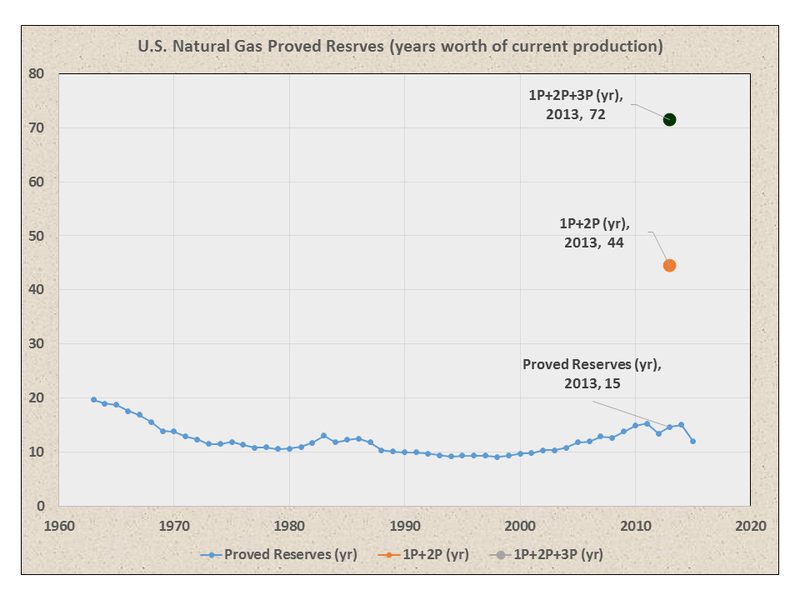 Since proved reserves (1P) represents the >90% estimate of the producible volume, during the initial years of production, proved reserves will generally grow. Most reserve additions don’t come from new discoveries. They are the result of well performance, reservoir management and extensions of existing fields. Recently Bloomberg put out a bar chart showing how the size of new oil discoveries has steadily shrunk over the past 70 years. Here’s that bar chart at the same scale as global crude oil production and reserve growth. There’s an old saying in the oil patch: “Big fields get bigger.” The biggest field in the world, Saudi Arabia’s Ghawar oil field was discovered in 1948. When first discovered, the estimated ultimate recovery (EUR) was in the neighborhood of 60 Bbbl. It has produced over 65 Bbbl and it is estimated to have about 70 Bbbl remaining (EUR ~130 Bbbl). Half of Ghawar’s EUR was recognized at its discovery. Half of it, or more, will be the result of field development and reservoir management. The EUR for Ghawar is not particularly controversial. Prior to the 1980’s, Aramco was at least partially owned by a consortium of American oil companies. Relatively detailed petrophysical data for the Arab D reservoir are publicly available. This remarkable production history is because of the enormous size of the Arab-D reservoir in the Ghawar Field. Alsharhan and Kendall (1986, Table 1) provide a figure of 693,000 acres for the productive area of the Ghawar Field. This represents a single, pressure-continuous reservoir. Cumulative production by year end 2000 was about 51 billion barrels of oil. The anhydrite in the Upper Arab-D forms the seal for the 1,300-foot oil column in Ghawar. It is composed of sabkha evaporites and subaqueous evaporites with thin carbonate interbeds that can be traced for hundreds of kilometers. The anhydrite thickens to the south at the expense of the reservoir zones; the combined thickness remains relatively constant. Using the petrophysical data from the Croft analysis, it’s very easy to get to an EUR of 130 Bbbl. Can we trust the reserve numbers of Saudi Arabia, Iran, Venezuela, etc.? Well,,, You certainly can’t treat them the same as the audited 1P and 2P reserves of publicly traded oil companies, but they’re probably fairly realistic 2P to 3P numbers. 3P is possible reserves (>10% probability). Note how the proved reserves of some nations suddenly jumped in single years. The big jump in Canada’s proved oil reserves was the 1998 decision to “book” its oil sands (AKA tar sands) as proved reserves, which had previously been assessed as uneconomic. The decision of accounting 174 billion barrels (28×109 m3) of the Alberta oil sands deposits as proven reserves was made by the Energy Resources Conservation Board (ERCB), now known as the Alberta Energy and Utilities Board (AEUB). Although now widely accepted, this addition was controversial at the time because oil sands contain an extremely heavy form of crude oil known as bitumen which will not flow toward a well under reservoir conditions. Instead, it must be mined, heated, or diluted with solvents to allow it to be produced, and must be upgraded to lighter oil to be usable by refineries. Historically known as bituminous sands or sometimes as “tar sands”, the deposits were exposed as major rivers cut through the oil-bearing formations to reveal the bitumen in the river banks. In recent years technological breakthroughs have overcome the economical and technical difficulties of producing the oil sands, and by 2007 64% of Alberta’s petroleum production of 1.86 million barrels per day (296,000 m3/d) was from oil sands rather than conventional oil fields. The ERCB estimates that by 2017 oil sands production will make up 88% of Alberta’s predicted oil production of 3.4 million barrels per day (540,000 m3/d). The fivefold increase in oil prices from 1998 to 2007 made Canadian oil sands production profitable. Analysts estimate that a price of $30 to $40 per barrel is required to make new oil sands production profitable. 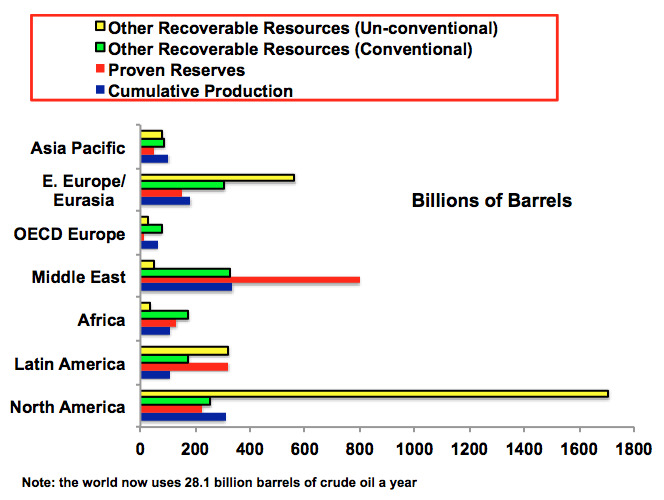 Note that uneconomic oil can and has been produced and sold… It just can’t be booked as proved reserves. Saudi Arabia’s proved oil reserves also made a big jump in 1990. It has been speculated that this was due to Aramco’s decision to claim that probable reserves were proved. However independent audits, related to Aramco’s possible IPO indicate that their proved reserves are actually greater than the 260 Bbbl previously reported. 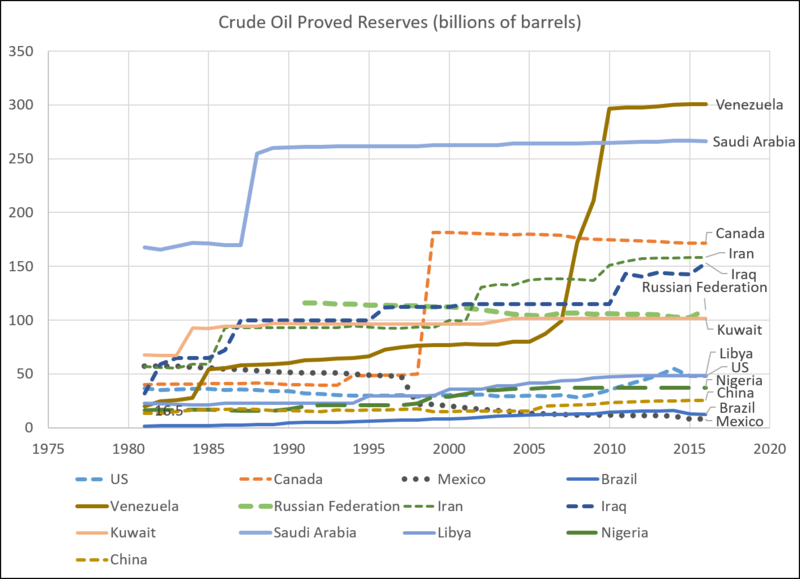 Venezuela’s proved reserves made a big jump in 2007, eventually surpassing Saudi Arabia with about 300 Bbbl of proved reserves. Presumably this was based on higher oil prices making the heavy oil of the Orinoco Fold Belt more economically recoverable. However, the Venezuela proved reserves are probably more analogous to possible reserves or contingent resources. 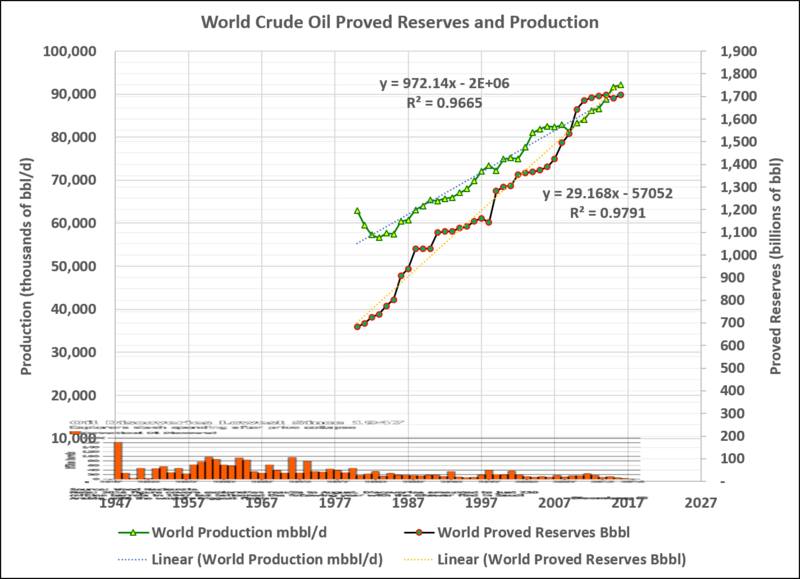 While international proved reserve numbers are generally not as robust as those of the US and other OECD nations, they are at least in the ballpark of probable reserves. “The elephant in the room” is either the smallest elephant on record or it’s one big @$$ room. Only someone with a kindergarten level understanding of economics could say something this stupid. If people are willing to pay to look at a 12,000 forest, than that forest has a value based on how much those people are willing to pay. What the leftists are saying when they make claims like this, is that they want what they want, and they don’t want to have to pay for it. First, the forest might be 12,000 years old but the trees are not. They turn over many times of that periods. Second, the forest will be obliterated in the next glaciation, so it is transient and thus expendable. If not destroyed by the ice sheet itself, the climate change during glaciation will kill it off. Another point regarding the so called Social Cost of Carbon is that they measured only costs. They included none of the benefits of carbon, such as fewer people dying in the winter, or more crops. Finally, the vast majority of the so called costs are imaginary, they exist only in the fevered imaginations of various computer models, while the benefits of carbon are current and well documented. In addition, even the 7% discount rate pails in comparison to the S&P 500 performance (1928 – 2017 average 10% return). American Indians used horses as a sign of prosperity. My grandfather used teams of horses to plow fields, plant seeds, and harvest crops. Today I live in a house heated by natural gas, cooled by air conditioning, and have modest cars in my garage with combined >500 hp. I would say there are benefits to carbon. Well, the down side is it allows stupidity to proliferate as well. The rat in the grain-bag is that fighting the boogeyman known as “climate change” has been an economic and human disaster, and if allowed to continue would be one of epic proportions causing such hardship, human misery and death, it would make the holocaust look like child’s play. Perhaps that is what the purveyors of “anti-carbon” policies truly want; reduction of human populations, beginning with the world’s poor of course. After a brief look at the last graph in this very informative article, perhaps it would be sensible foe Venezuela, Saudi Arabia and Canada (apparently up to 50% of world’s crude reserves), not only to stop any further explorations but downgrade by at least by 50% or even more the quoted numbers. As they are small population countries, sometime in the no so distant futures they might be subject of military interventions in order to take control of their huge energy resources. While on the subject of sources of available energy, one source that has no fear from any kind of invasion by the energy hungry world powers, among all those of yotta watts that it flings freely in all direction, it has reduced it’s output slightly again during September. The ‘classic’ sunspot count number (Wolf SSN) was down to just above 2 points while the new SIDC reconstructed number was at 3.3. I usually finish this monthly report with: “SC24 is nearing what might be the start of a prolong minimum (possible late start of SC25 too) but even a ‘dead cat bounce’ from these levels is unlikely”, as things stand I see no reason why I would need to change it. my sincere apology for not double checking the link before posting, I hope this time it works. The elephant in the room is the assumption that nature’s resources and capabilities are so large that they can be considered infinite and so excluded from the economic cost of production. This has the unintended consequence of rewarding destruction. At one point in human history, things changed. Prior to that, resources would become scarce and societies would collapse. After that, technology was sufficiently developed that people started using resources more efficiently or were able to substitute different materials. It’s called dematerialization. Studies on material use and economic growth show instead that society is gaining the same economic growth with much less physical material required. Between 1977 and 2001, the amount of material required to meet all needs of Americans fell from 1.18 trillion pounds to 1.08 trillion pounds, even though the country’s population increased by 55 million people. Al Gore similarly noted in 1999 that since 1949, while the economy tripled, the weight of goods produced did not change. Buckminster Fuller calls the process ephemeralization and points out that, in theory, there is no limit to the process. The real elephant in the room is that we are dependent on technological progress. If it stalls out, we could be in real trouble. Thomas Homer Dixon refers to the Ingenuity Gap. If we listen to the alarmists, we probably will bork the economy. Technological progress will cease and things will come crashing down rather quickly. Talk about a self fulfilling prophesy. Another way to look at ‘ephemeralization’ or “doing more and more with less and less until we do everything with nothing” is the the workload has not changed, it still requires about the same amount of “horse power” to harvest a field ( a bit less due to education and improved methods), but we merely have shifted the work load from the backs of laborers to machines and robots. The laborers may be doing less and less, but the fields have not gotten any smaller (well perhaps some due to improved yields). I have this nagging Economic Growth in my wallet. It keeps filling so often that I get lopsided sitting on it. I wonder if Monbiot knows any Enviro-Mental Doctorates that can help me lance that nasty Growth. Sorry peeps – this is Faerie Counting and giving justification to others to continue doing so. Social Cost of Carbon is One Million Miles away in Lala Land. In all industries bar one. That we are mammals is proof enough. Yet we have consigned ourselves to eating food from The Very Base of the Food Chain. Yet we are now utterly reliant on cooked starch = Glucose basically = the very first thing created by photosynthesis. No vitamins. No minerals. No proteins and very poor food for the most important organ we have our brains. Yes, brains will run on glucose, but Ketone, produced by our livers chopping up saturated fat is what it was designed to burn. Our heart burns saturated fat directly. Flooding it with glucose damages it – hence why 45,000 people daily pass-away from Cardio Vascular Disease. We have reached the bottom of the food ladder and there is nowhere else to go. Yet we burn plants, safe in the knowledge it will save the world. The insanity was nicely exemplified today in something I came upon. Concerning folks who may have an inclination to give up booze for the month of October. As a sort of Lent if you like. Surprise, no surprise, A Doctor races to the scene to say that suddenly giving up booze may be harmful and folks should consider doing really carefully/gradually. See what happens when you rely on a mind bending chemical sugar for your ‘staple’ food? Given the same plants, fertilisers, crop-protection chemicals, planting techniques.. The Dust Bowl was NOT a Climate Event. The big flurry of dust was likely related to agricultural practices that destroy rather than nourish the soil but it would still not have happened had there not been a regular, periodic drought that the area has experienced many times in the past. An actual logical example of nourishing the future… Two thumbs up, Norman Borlaugh! The soil in the area was not that fertile to begin with, and droughts were and still are common. The central plains were once called the Great American Desert for a reason, and pioneers initially skipped over it in favor of the west coast. Corn and other nutrient-hungry crops, planted every year without fallow time, depleted the soil of water and mineral binding agents. Clearing native perennials from fields left the topsoil unanchored. Very few trees or other terrain obstacles meant winds blew unimpeded. All that was needed was another major drought to create the perfect (dust) storm. In our current environment there’s no need for the populace to fear attacking CO2. Few have experienced anything other than an incremental rise in electricity cost, manufacturing plant closures, and power shortages. Wait until/if the alarmists really get their way and the scenario will be different, much different. Personal transportation will be unaffordable for many and that impact alone will cause major problems for society. Rural living will cease for all but the well off and the increase in travel time will add hours to the work day. The disruption to all facets of society won’t be tolerated by the masses as you can’t expect people to accept forced lifestyle downgrading. That will be the true cost of Alarmism. here since I first visited in 2015. It there some sort of a prize for that? I’m not going to pretend I read it. into my old Apple computer. 1) virtually every ton of mineral materials we have produced is still on the earth and much of it concentrated in landfills, etc. Today we are recycling more and organizing recovery of these resources. Metals we have been recycling for millennia. Almost all the gold brought in caravans across the Sahara from the 10th Century or more is still with us. Your wedding ring contains a bit of it. Iron, copper, lead, etc. were valuable and when an item made of it was no longer useful it was melted and re-used for millennia. Today we are recycling plastics, glass and even bricks, drywall (gypsum board), asphalt, concrete, etc. The largest producers of gypsum for wallboard (another synomym) is flue gas scrubbing in the USA. 2) We don’t demand zinc at all, we demand rustproofing for barnrooves, culverts, ducting, etc., which are now even made from plastics. Substitution is a major part of the “endlessness” of resources. 3) Miniaturization – “my” first computer was a university one in 1967 that took up an entire airconditioned room and didn’t have the computing power of my cell phone. My fathers old 1948 Chrysler Windsor could be melted down to make two or more cars of today…..
4) Mining has become a topping up activity. Nevertheless, new exploration and mining technology has made discovery of hidden resources and their efficient extraction a huge boost in resource availability. Cut-off grades for gold are ~0.5g/tonne. 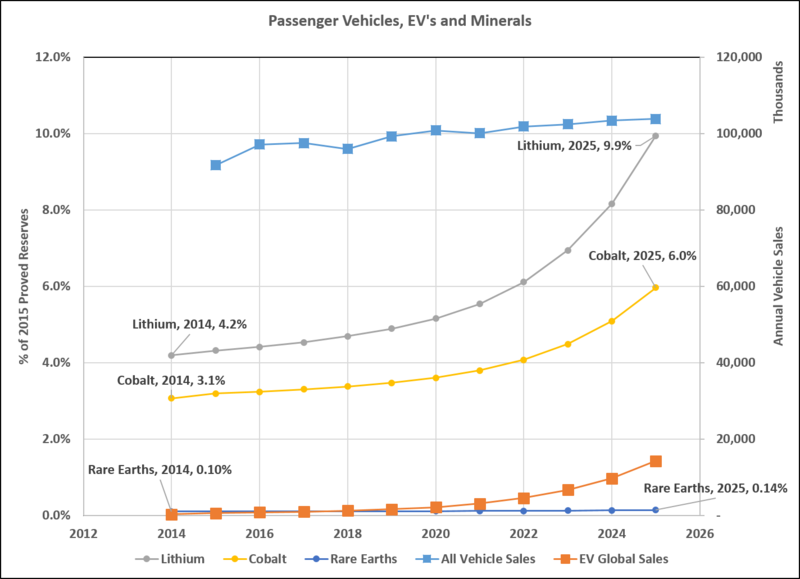 The USGS has recently put out a paper on new resource potential for copper globally at 3.5 billion tonnes, noting that it is enough to satisfy current demand for 150yrs. This doesn’t account for the fact that 34% of copper use in the US is obtained from scrap, which is part of demand. 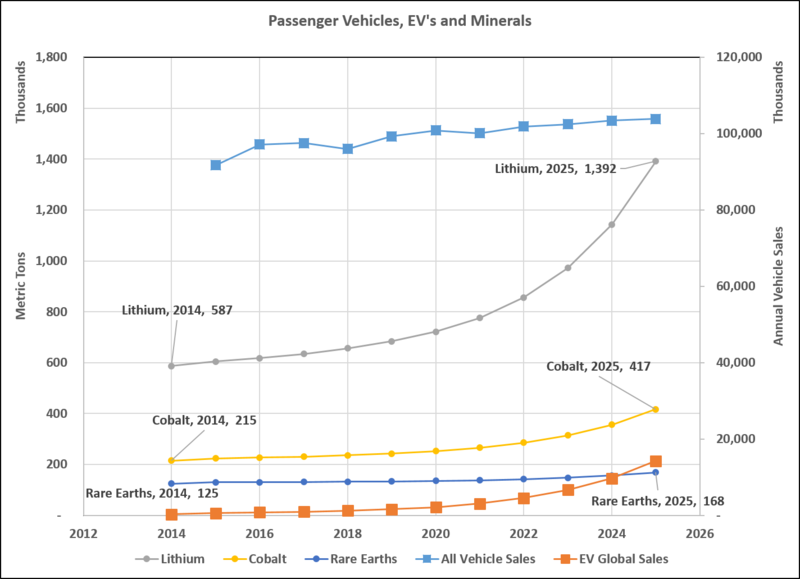 So the new copper, plus increased recycling, plus miniaturization and substitution (aluminum) means the 3.5 billion tonnes is good for about 1000yrs. The Stone age didn’t end because we ran out of stones, nor the Bronze age, nor the Iron age for similar reasons (the lack of raw materials). However please note western civilization did leave the Dark ages when enlightenment happened. Enlighten yourself George, you are just plain wrong on so many things you’ve become a joke. So wake-up George and smell the abundance of coffee, tea, chocolate and all the other items we are NOT depleting. The one thing George and so many others like him show is that humans are not even close to reaching ‘peak stupidity’. “Make the UK more bicycle-friendly, like Holland”. Holland is bicycle friendly because it is flat. So what we need to do in the UK is to build the world’s most enormous flat iron, and iron out all the hills. Then the government must compulsorily purchase all front gardens to make space for wide cycle lanes. In town where buildings have no front yards, the buildings on one side of every street must be demolished to make room for cycle lanes. There, job done, the UK will be just like Holland. You will be able to bowl an Edam cheese along the road and it will keep rolling for ever. The “social cost of carbon” is not a constant independent of the total size of the US economy. Nor is it independent of necessarily-related emissions that take place in China. As such, it strikes me as useless. A bit like a global mean temperature. Just because something can be calculated, that doen’t mean that it has any meaning or value. Its main value seems to be proof that economists, like climate scientists, should have their computer use supervised by adults. It would have been a lot shorter if I didn’t have to thoroughly explain reserves vs resources. Articles: Social Cost of Carbon. Has become a global issue. Or made into a global issue? The true cost of growth and success is that we get tons of people with little to do, and they have to feel important . . . so bring on the doomsayers. He, it beats working an honest job. The real tragedy of the global warming mania is that by association it has discredited perfectly reasonable and sensible arguments about our living and working environments. An example in the opening paragraph, about UK cycling. It is now common for skeptics on warming to ridicule all proposals for lowering real noise and particulate pollution in UK cities, including the banning of diesels, reducing automobile traffic, and making space for the safe use of bikes for everyday transport. And yet, these are all reasonable and sensible things to want. The thing that is totally outlandish is that we have allowed the car to destroy relaxed and safe use of our living and working environments. Walk down Oxford Street, drive down the A12 as it enters East London, and you will see it. Its obvious. Or it would be obvious, and we would probably be doing something about it, were it not that these measures have got entangled in the public mind with global warming mania, and the idiotic and counterproductive or useless measures alarmists advocate to ‘tackle’ it. This is a real tragedy. We could make our cities healthier, more liveable, nicer places to live and work, if we would just engineer them with that in mind, particularly regarding transportation. But because the required measures have been tarred with the global warming mania brush, it has become easy for the auto lobby interest groups to dismiss them. The most important thing we have to do, those of us who actually care about the local environments in which we live and work and play, is to disentangle the two. And to make the case that while CO2 does not matter in the least, noise, dirt, particulates and NO2 do matter, and matter a lot, and should be controlled and reduced dramatically. If it would take raising CO2 to do it, we should do it. And if it would take reducing traffic, which it will, we should do that too. 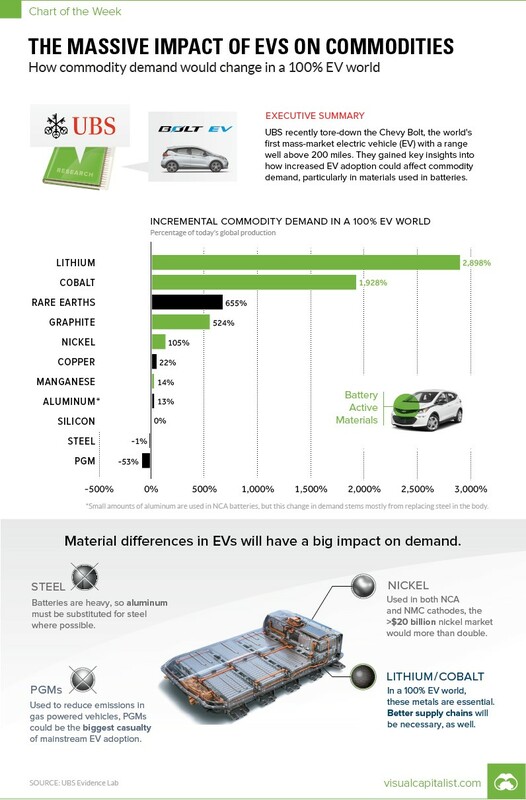 This is the case for electric cars. Not that they emit less CO2. If they emitted more, this would still be better than the exhaust fumes of other noxious sorts from ICE vehicles. Cars have improved city life, not destroyed it. Providing space for bicycles can only be done by taking land from somebody. Just how many people do you intend to sacrifice in order to improve your quality of life? I am advocating taking road space from cars to give it to bikes. Cars have no particular right to exclusive use of roads and streets which are public property. The streets and roadways belong to all of us, and are funded by all of us, whether cycling, walking or whatever, and there should be adequate provision made and adequate restrictions imposed so that we can all use and enjoy them safely for other things than driving through them. There is no reason we should permit the discharge of large amounts of particulates and NO2 into air people breathe as they go about their daily lives. I am advocating getting ICE engine vehicles (apart from deliveries) off shopping and living streets. This is already done in other countries, notably Holland, and the result is to dramatically improve enjoyment of where they live and work by the people who live and work there. I am advocating stopping treating neighborhoods where we live and work as places we all drive through to get to where we live and work, only to find when we get there that others are treating them as places to drive through. And as for sacrificing people? Today we are killing over a million people a year globally in traffic accidents. In the UK we are killing something like 1,700 people a year, and we have total “casualties of all severities” of 176,500. Of these there are several thousand life changing injuries. I wish to put a stop to this. i want a zero defects approach to the problem. The target should be no, zero, traffic deaths. if that means restricting peoples right to drive, which it does, so be it. And I want us to stop in public policy these idiotic attempts to limit CO2 emissions no matter what the effect on real pollutants, and I want to stop linking the subject of air pollution to the global warming mania. It was this that led to the diesel disaster which dramatically worsened real, health affecting pollution in the idiotic attempt to lower CO2 emissions at the price of increasing particulate emissions. As to whether cars have improved cities? i suggest going to one that has severely limited them. There are some. Then see how you feel. The sense of relief, of freedom, of empowerment has to be felt to be believed. It is like a jackhammer stopping that endless racket outside your window. We are all destroying the common environment in which we all live, work and play, and we have to grow up and stop it. The standard left wing whine. Give me what I want, I don’t care who has to be sacrificed to make my life more pleasant. Do you think what the car has given you is worth a million deaths a year? Its the typical no-nothing whine that because I like driving, death and destruction is no object, because I and my family are going to be blessedly immune. Someone says, its always the driver who is blamed. No, I do not blame the drivers. What is at fault is a system of transport that is unfit for purpose and dangerous by design. If we were proposing introducing such a system today, and it did not exist, consider what we would be saying. We will kill a million people globally a year. We will cover the country with highways. We will emit vast quantities of dangerous pollutants into the air we all breathe. We will spend years of our lives sitting in fume soaked traffic jams when we could be doing nicer and more productive things, but there is no other way to get from a to b. It will be great, won’t it? So much better than public transport. Right. In order to do all this we will spend big chunks of our disposable income on elaborate machines, so we can join in, take the risks, waste the time, emit the pollutants. Do you think you would have the slightest chance of getting such an insane proposal adopted? Driving is a privilege, not a right. You must prove a minimum level of knowledge and competence to be issued a license to drive on public roads. Would that were the same for non-motor cyclists. Bicycle riders are some of the most flippant, unpredictable, and disrespectful people on the road here. Made worse by an Oklahoma law that gives them the same right-of-way status as motor vehicles. In accidents involving a motor vehicle and one or more pedestrians, 9 times out of 10 the pedestrian is at fault. When passing through town I almost always have to slow down for at least one jaywalker who comes bounding off the curb without even looking one way, let alone both. And bicycles run people over too, you know. My sister can attest to that. She needed stiches to put her nose back together as a kid when a cyclist bowled her over in the family’s own driveway. PS. The cost of freedom is risk, often even the risk of serious injury or death. If you want a society free of risk, you must accept a society with no meaningful freedoms. Out of curiosity one day, I estimated the world’s population size by volume, with everyone stacked in cubic pile with no spaces. How big do you suppose the pile would be? I came to a cube 0.4km is size. It would fit in my neighborhood. That’s what is feared will consume the resources of the entire planet. Recommended reading: The Skeptical Environmentalist by Bjorn Lomborg. It is filled with examples of similar exercises. Meanwhile coal prices in Europe reach 5-yr high. This is the kind of idiocy I am talking about. Do these people want to restrict noise, particulates, NO2? No, they are not worried about any of those pollutants which do really damage life and health in the areas of our cities where we live and work and play surrounded by them. No, the idiots want to lower CO2 emissions, which cause no problems to anyone. In fact, if we could lower the harmful emissions by dramatically raising CO2 emissions, we should do it. The problem isn’t the CO2. But the problem with focussing on it is that it takes attention away from the really unpleasant and unhealthy emissions and costs of swamping our cities with ICE vehicles. •Reduce the human population… “but this obviously raises some unpleasant decisions.” Not if you’re a Vogon. True, the Vogans had no qualms about the population elimination that would result from their plans, but they also had no qualms about the complete destruction of the planet that the eliminated population was living on either. So probably not the ones you want to put in charge of *saving* the planet. And in other news, not counting the cyclists and pedestrians…. And this does not count the enormous other non accident costs, such as inability to use the streets other than to drive, and the air and noise pollution the system causes. And that is just the USA. Dangerous by design, and not fit for purpose, and if we were starting from scratch, and cited the costs and benefits, a trasnport system which would never make it past the first hurdle. Michel – striving towards a more pollution free existence is admirable and is actually the target of most governments and businesses at the r& d level. However you should direct your energies to solving the problems of the real world not some dream world. What you say is true but has come about through choice and prosperity, you cannot force your sort of idealism on the general masses without taking a very large chunk of their freedoms away. Holland has more bikes and this helps to clean up and decongest city centres – but not very much. My last visit to Holland had me sat in a traffic jam(the normal) for 1.5 hours. electrifying the transport system is also a good idea for city centres but is totally impractical for inter city or international travel as it just moves the exhaust waste from the exhaust pipe to the chimneys of power stations or the factories for renewable equipment, or from the most abundant and free energy production removed by covering the green parts of our land. You ask whether people are happy with the deaths total. I would say yes they are – very happy as it is generally reducing. The ownership of a car is a massively liberating experience -ask any teenager getting his licence. The advantages far outweigh the risks. Modern regulation and safety levels of the car itself have vastly reduced the risk of accidents even in increasingly crowded transport environments with many more on their way with the latest driver safety monitoring technology. As for the pollution risk – I ask you this. If particulates and NO2 are such a great risk why is it that workers who spend nearly all their working lives on the road and a large chunk of their private lives as well – combined with the majority of them living in large conurbations – do not die at an appreciably younger age caused by these factors (having a sedentary and bad diet lifestyle being the more likely cause of bad health). Do you think possibly and as usual the poor use of statistics is being used to sway public opinion against the supposed evil fossil fuel in cars!! Certainly what I think. My advice to you is be more pragmatic in your approach to human existence and you will sleep easier. Hence the German situation in Hambacher: the lignite has value because it can be sold to be burned, the 12,000-year-old forest has none unless the trees are cut down for economic use. And, in an infinite world, there are always more 12,000-year-old forests. Until the High Middle Ages, you could hike from the North Cape to finis terre without ever leaving the shadows of the forests. During the Gothic, the French king and Entourage respectively went. The German Emperor in the thickest forest to be shown by the master builder of the most powerful tree for the rooftop poe of “his” cathedral. In “12,000 year old Hambacher forest” Noone will find a tree that would suspend the roof of the kings cathedral. Until the High Middle Ages, you could wander from the North Cape to finis terre without ever leaving the shadows of the forests. During the Gothic, the French king and Entourage resp. German Emperor went into the thickest forest to be shown by the master builder the most powerful tree for the rooftop poe of “his” cathedral.